1) What Is Air pollution? How to control and reduce air pollution? 2) What is Noise pollution? 3) What is Water Pollution? How to Reduce Water Pollution? 4) What is Soil Pollution? How to reduce soil pollution? If you keep a tab on the current news and affairs, I’m sure you must have heard about pollution. Why even news, do we not feel and experience pollution in real life? If you want to write an essay on pollution, you’re in the best place. And, how to reduce pollution easily. Wikipedia defines Pollution is the introduction of contaminants into the natural environment that cause adverse change. Pollution can take the form of chemical substances or energy, such as noise, heat or light. Pollutants, the components of pollution, can be either foreign substances/energies or naturally occurring contaminants. Pollution is often classed as point source pollution or nonpoint source pollution. In 2015, pollution killed 9 million people in the world. Pollution is the state of the environment when something external (a foreign matter) is added to the environment that is harmful or poisonous to all living beings. Pollution is a middle English word derived from the word pollute which is again derived from the Latin word pollutio which means to soil or to defile. Pollution is the process of addition addition of unnatural, foreign materials to our natural resources thereby making it harmful or poisonous for living beings. While natural causes of pollution like volcanoes, earthquakes occur, it is man made pollution that has the most adverse effect on nature. Air pollution is the worst form of pollution which is caused due to emission of poisonous gases (from vehicles, factories, crackers), liquid aerosols and deforestation that kills trees and forests who save our air pollution to a great extent. Deforestation also is one of the major cause for water pollution where air pollutants make the water acidic and unfit for drinking. Similarly, global warming is increasing the temperature of water which is hazardous for aquatic plants and animals. The industrial revolution also is a major cause of pollution. Industrial pollutants like sulphur dioxide, CFCs, nitrous oxides etc which then mix up with the rain water causing it to pollute by converting them into acid rains. Water pollution is currently the most feared form of pollution where we pollute our clean natural drinking water with sewage (from factories and urban drainage), air pollutants causing acid rains, oil spills thereby making water imperfect for drinking and usage. Water pollution also kills a huge number of flora and fauna in the water ecosystem. Similarly, land and noise pollution have raised serious concerns and must be acted upon fast to prevent them from growing. The Exxon Valdez oil spill is a perfect example of how human carelessness killed millions of aquatic flora and fauna. Soil pollution is also one of the major concerns where urbanization is the culprit. Urban setups, building towns by cutting trees, factories that emit lot of pollution like waste materials and by products all cause soil pollution. Using harmful chemicals to prevent pests, insects go and mix up in the soil thereby making it poisonous for living beings. Similarly, usage of excessive fertilizers make the soil unfit for living beings. Wastes from households, huge drainage systems in big towns, and factory sewage also make the soil dirty and pollute it. Noise pollution is more popular in urban areas where the high volume of sound from vehicles, flights and helicopters, different workshops, machine noise etc make it impossible to stay in those areas. We as humans like calm environment but noise pollution adds a constant din in the day to day life that is harmful for the ear and can cause deafness in extreme cases. Birds and animals die due to noise pollution and students cannot study mindfully. Similarly, old aged people also have a big issue with noise pollution which takes away their peace of mind. As responsible citizens, we should say no pollution causing products, refrain from using fossil fuels likes coal, petrol and start using eco-friendly products. Another big thing that we can do is, plant more trees, support afforestation so that they prevent soil pollution, keep our air clean and safe and also reduce global warming which is a by product of air pollution. We can prevent pollution by educating people, fellow students and relatives to stop using vehicles if possible or use a local transport like buses or car pulls to commute. This is a longer version of our pollution essay for graduate students and readers looking for detailed pollution essay in 1000 words or more. You can of through it to get a detailed idea about pollution in English and the scenario of how it has effected us so far. Pollution is the process of addition of harmful elements into the natural resources like air, water, and soil. These are often the result of man’s desire to live a luxurious life. However, these action of pollution makes it very difficult for living beings to live a healthy life because of the harmful effects of pollution. Let us now know the different types of pollution. There are various forms of pollution such as air pollution, noise pollution, water pollution, etc. Out of the above list, the first four are the ones that have raised serious concerns. Let us find out about each of the pollution types, their causes and how they can be stopped. Air pollution is the act of emitting (polluting) various foreign materials like industrial wastes, automobile emissions, and harmful particulate materials into the air which makes it unfit for breathing or sustaining living beings. Air pollution is the worst and most fatal forms of environmental pollution. The air pollution arises due to the introduction of harmful chemicals in the air. Both natural process and human activities are responsible for causing air pollution. Considering the human-made sources of pollution, these include burning of different types of fuels, fumes from sprays and paints, deposition of waste cause methane and military resources such as toxic gases and nuclear weapons are some sources of human-made air pollution. The natural sources of air pollution include dust from areas that have less or no vegetation, carbon monoxide and smoke emerged out of wildfires, volcanic activities producing chlorine, sulphur and ash particles and much more. Since there are a huge number of vehicles on the road today, it has led to the emergence of a lot of smoke and disbursal of harmful toxins that are very bad for the body. They cause contamination of air, which we breathe and fall sick. Thus, it is important to use less of vehicles on the road. How would you travel then? Use public transport. Since the public transportation is such that it can carry more number of people than normal two and four wheelers can do, it is preferable to use public transport. In the metro cities, the development of metro has massively helped people travel without using their own vehicles. The metros have a capacity to carry over 1000 people at a time. People generally prefer burning out the organic waste. Instead, consider decomposing it. The matter will turn out to be an organic manure that can be used heavily for agricultural purposes. On the other hand, burning of waste leads to air pollution. Plastic is one of the major sources of air pollution when burnt. The plastic is so harmful when burnt that the smoke it releases is infected with cancer leading particles. When we breathe in this air, we are more prone to deadly diseases. Noise pollution is the deliberate act of introducing higher levels of sound that may have harmful psychological or physical effects on living beings. All living beings can tolerate and thrive well in sound level of 70dB but a sound level of 85dB (like busy roads, workshops etc) for more than 8 hours a day can result in serious health problems. The disturbance caused due to noise which leads to harmful consequences on humans and animals is caused noise pollution. Some of the primary sources of this pollution are the machines, transportation, trains, motor vehicles, etc. If the industrial and the residential areas lie side by side, they bring a huge impact on the people such as hearing loss or coronary artery diseases. In animals, the noise pollution holds a tendency to cause them death. It is thus very important to have an urban planning since most of the noise pollution is from the urban areas. The development of industries, residential areas, hospitals should maintain enough distance in order to avoid the adverse effects of the noise. Make residential areas outside of industrial location of transports like railway lines. Do not produce high levels of sound (usually on parties/celebrations) after 8PM or evening. Noise pollution commonly emerges from industries, factories, railways and airports. The best way to get free of noise pollution and save your health is to stay away from industrial areas, railway lines and airports. Try to locate yourself in residential places that are calm and peaceful. Generally, these residential areas are built away from these noise-making places. Make sure you stay in one of them. If you are wondering how to reduce noise pollution at home, you can talk slowly, close the doors while working or studying so that outside noise doesn’t effect you. Do not use car and bike horns unnecessarily: Do not use horns in your cars and bikes unnecessarily. This will broadly help in evading noise pollution. Make sure you are making a minimal use of the horns near hospitals. One should understand that hospitals are full of patients. It might be really disturbing for the people inside. Thus, avoid making unnecessary noise near hospitals and residential areas. Water pollution is defined as the deliberate act of introducing harmful materials into the water like urban sewage, industrial waste waters, oil spills etc. Another indirect source of water pollution is soil pollution. When we pollute the soil with fertilizers and pesticides, these accumulate in rain water and flow to the rivers and seas. Which then makes the water polluted. The water pollution is caused when the impurities are added to the water bodies such as rivers, oceans, lakes, groundwater, etc. It causes environmental degradation. Water pollution is generally due to the discharge of the contaminated stuff without treatment into water bodies that releases harmful components in the water. It damages the biological life in the water at large. Moreover, the humans and animals, both are affected due to non-availability of fresh water. The major causes of the pollution include pathogens, chemicals and toxins released from the factories and otherwise. Huge industrialization and urbanization have led to widespread water pollution. In order to get rid of water pollution, it is imperative to evade the contamination of water bodies. Majorly, it is the industries from where the contaminated substances emerge out and get into the water bodies. It is essential that proper treatment with the waste is performed before getting them added to the water. Also, we should ourselves take steps not to implement any of the unnecessary activities in the water bodies such as throwing garbage or disposing of wrong content. Moreover, do not waste water. More the water you consume more will get collected with the dirty water in the environment. It is very important to preserve our mother earth by not causing any sort of pollution. We must ensure all the preventive measures are taken by us as well as by the people in our surroundings. It is thus vital to create awareness spreading pollution information and get rid of the same. Soil pollution is the act of polluting the soil by adding various harmful waste materials into the soil without proper treatment of them. The major soil pollutants include solid, non-biodegradable household wastes, industrial byproducts, deforestation and use of chemicals like pesticides and fertilizers. Soil pollution can be drastically reduced proper awareness and doing little acts like processing the waste materials before emitting them to the environment. We can also get rid of soil pollution by planting more trees, reducing the amount of trees and forests we cut or by planting more forests than the ones we cut for our needs. We can also reduce soil pollution by using bio-degradable products, reducing the amount of chemical fertilizers and using organic manures and fertilizers for our farms and agricultural works. With the rise of technology we are seeing a huge rise of pollution. Sometimes we are the main cause but it is never too late to prevent something. We can start today by preventing environmental pollution to create a greener India and greener world as a whole. 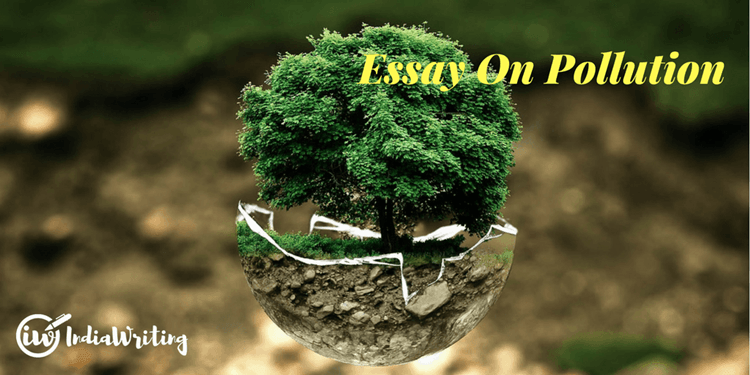 I hope you liked our essay on environmental pollution and would love to know your thoughts on it. Comment below your favorite tips from our pollution essay and share it across with your friends using the social share buttons on the side (or below this section).